It’s free! We require age verification with Facebook. WHAT IS "MEET & EAT"? 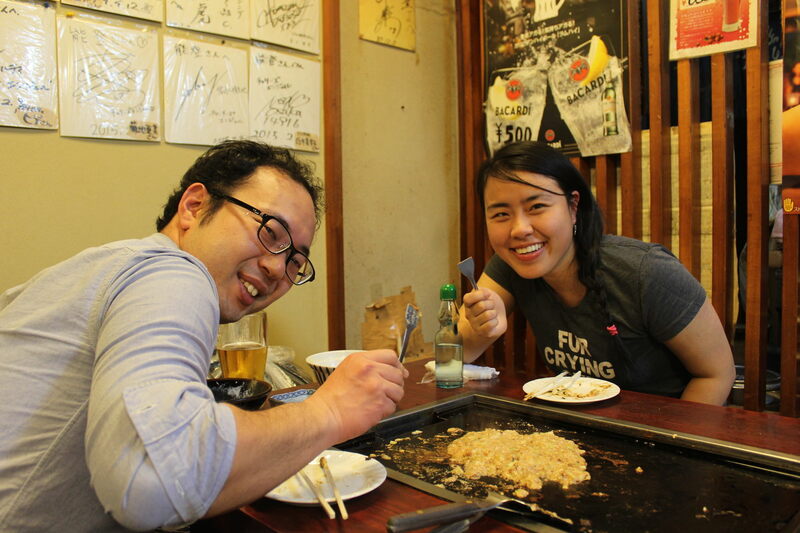 MEET & EAT is a service for travelers (you and your company) and local Japanese (him/her and their company) to meet up, have a meal, and exchange cultures in a small maximum of 3 and 3 group. Sit together, enjoy local meals and drinks while having great conversations just like friends! * Since MEET & EAT is currently a beta service, we are offering the service for FREE right now and the service is provided limitedly in Tokyo. UNIQUENESS OF "MEET & EAT"
2. No need to spend money You only have to cover for your food, drinks and transportation to the restaurant. Please split the bill at the restaurant with local Japanese. 3. Delicious local food and drink Enjoy delicious food, drink, and cultural exchange at our Partner Restaurants which locals often visit! 4. Japanese don’t aim for earnings Japanese participants are not "hosts" who aim for earnings; they just want to meet people. They may not speak perfect English, but brings REAL interactions! Who likes to experience something non-touristy. Who wants to feel the real culture by interacting with locals. Who wants to chat with someone with same interests. Who likes to make new local Japanese friends. Local Japanese who join this activity is ordinary Japanese who do not have business objectives. Their common interest is to have cultural exchange and practice their English, and more than anything, enjoy meeting new people. Therefore, not all of them speak fluent English, but we think that makes you able to experience the real Japanese culture by interacting with real Japanese. Fill in the Request Form Put information about you and your request in the Request Form. Communicate with Japanese View profiles and communicate with people you are interested. Decide one local to meet up if you get more than one reply. Book and go Book the restaurant and show up on the decided date, time, place. Enjoy! Since MEET & EAT is currently a beta service, we are offering the service for FREE right now. The only fee you need to pay is for your own food and drinks. Please split the bill with local Japanese at the restaurant. GALLERY Many travelers participated during test period with limited locals! All of them enjoyed very much. MEET & EAT is intended for exchanging cultures between groups, and we do not encourage people to use the service as one person. Meet up at somewhere public and enjoy the dinner at restaurants with people’s eyes. We encourage our users to meet up at the exit of the nearest station from the restaurant and walk to the restaurants taking streets with lights. We prohibit to use the service for dating, business, and solicitation objectives strictly in our terms. Please enjoy MEET & EAT at our partner restaurants to avoid troubles. If you are going to anywhere except Partner Restaurants, be careful not to take and go to places that are not public. Please be careful to not cause troubles due to too many alcohols, etc. We suggest splitting the bill for food and drinks. Ask each other and make sure you all agree when ordering food and drinks. We do not investigate our users with IDs, and many unspecified people use our services. We require applications for local Japanese only, but the investigations are quite simple and done only according to self-assessment. We do not assure any troubles occurred by using our services. Please pay full attention to enjoy the service safely. Also, please read through instructions and understand the service well before participating. Hub Japan monitors the posted contents 24 hours. We may disable or delete the account in case we find something inappropriate. Please also read thoroughly MEET & EAT help page and terms for other notices.